For today's posting, I would like to share with you this two awesome covers that I received from ICCC, which stands for 'International Cover Collectors Club'. It is a cover circuit club from Switzerland. The first cover was sent from Liechtenstein by Vural Oguz, director of ICCC. It is my first cover from this western european country! Thank you so much for your effort! 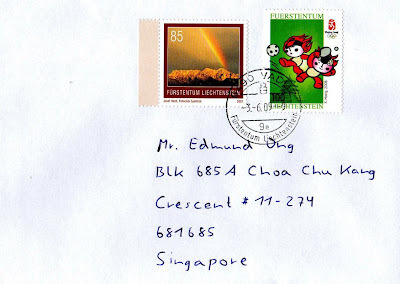 The beautiful stamp franked on the left of this cover belongs to the "Natural Phenomena" series, issued on 19 November 2009. The 3 lovely stamps in this set depict Rainbow with the Three sisters Massif (85), Lightning over Bendern (100), & Halo in Malbun (180). 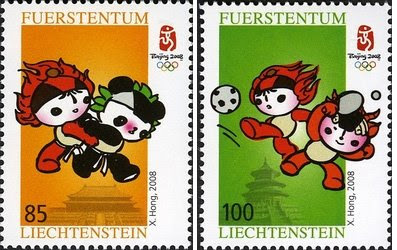 Like many other countries around the world, Liechtenstein issued a pair of stamps to commemorate the Beijing 2008 Summer Olympic Games. One of the stamp can be seen here on this cover. It was issued on 2 June 2008. And here is the complete set. 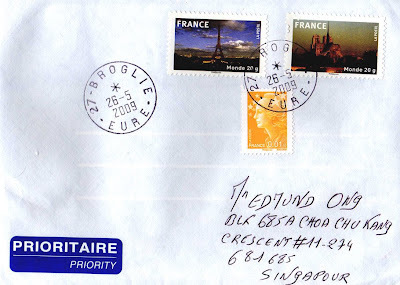 The second cover was sent from France by fellow ICCC member, Marc Landois. Merci! The 2 beautiful stamps franked on the top are from the "France Images" series, issued in 2009. One of the stamp features my favourite monument, the Tour Eiffel (Eiffel Tower). Last but not least, we have a stamp from the 2008 "Marianne" definitive series. Marianne has been used on most definitive stamps issued since 1944, as well as several commemorative stamps.